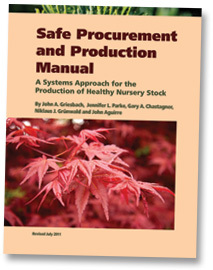 The “Safe Procurement and Production Manual,” published by the Oregon Association of Nurseries, is a 106-page guide to producing healthy nursery stock by using a systems approach. It is available online as a PDF download, at no cost. According to a story published by Capital Press, the importation of live plants into Oregon and the U.S. is a primary pathway for invasive insects and pathogens, some of which could cause severe damage to forests and nurseries. The statement was made by Wyatt Williams, an invasive species specialist with the Oregon Department of Forestry (ODF), who spoke last week at the Northwest Agricultural Show held in Portland. He estimated about 4 billion plants arrive in the country each year. Federal monitoring is done at 18 stations with only 63 full-time inspectors, and standard inspections may miss an estimated 72 percent of pests. By backtracking invasives and comparing shipping records, experts deduced that 69 percent of invasive insects and diseases arrived with live plants. The Oregon Association of Nurseries is well aware of the problem, and has endorsed a systems management approach detailed in a 106-page publication, “Safe Production and Procurement Manual.” The manual, available online at http://www.oan.org/default.asp?page=861, lays out best practices for greenhouses and nurseries to detect pests and diseases and respond quickly if they appear. Jeff Stone, OAN executive director, said that the manual is an industry standard and has been used as a model elsewhere. It also helped shape USDA policy governing interstate shipment of plant material. Interested parties can download the manual or acquire a hard copy by calling 503-682-5089 or stopping by the OAN office (29751 SW Town Center Loop West, Wilsonville). Supplies are limited.